Meet Will Shea, a con artist who has bluffed his way into one of the nation’s most exclusive private schools. But Will isn’t the only scammer at Connaughton Academy—Andrea Dufresne is there too, and the ivy-covered campus isn’t big enough for the both of them. A good book. Not a great book. Not a bad book. A good book. 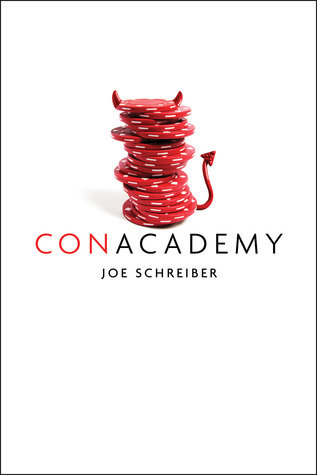 Con Academy entertained me but didn't necessarily impress me. I love the concept of this book. First of all, it's set at a posh boarding school. Second, it features two ballsy kids who've successfully conned their way into the school and are going to con the school's biggest jerk. The ingredients are good. They're just not mixed together smoothly enough. The con and the conners are great. Will sets up an online poker scam and Andrea gets close & comfy with Brandt, the mark. The cons work out to be complex and have twists and turns as the two scam artists try to sabotage each other. Did it all feel a bit unrealistic? Yeah, but I had such fun that I could forgive it. Where the story starts to fall apart is with the rest. First of all, Will's family, including his dad and uncle. Uncle Roy is there to help him run the con. Will's dad is a troublemaker and sticks around because no one can get rid of him. I liked these characters; they added color to the story. However, they could have been better developed. The real problem is Gatsby - the girl that Will falls for. This felt like a "Must Have Romance" throw in. I only got a bare-bones impression of who she was. She was there entirely to service the story. Most oddly, it felt like insta-love when there actually wasn't much romance at all. I enjoyed Con Academy. I laughed, I was even surprised a few times. But it never came together as it should. I'm happy I finished the story, but I only finished because I got to 50% and figured I might as well find out the end. Here's How to Buy the Book! I like the sound of this one despite some of its problems. I think my reluctant readers will pick this one up. It reminded me a bit of Heist Society series by Ally Carter. I love comments. I appreciate every one! Thank you in advance. This blog is now an award free zone. I just don't have time to pass on the awards as they deserve.